Let’s start with disclaimers. I’ve seen William Castle’s THE TINGLER (1959) at least fifteen times, including six times in movie theaters (in New York and Los Angeles) – all with the infamous “electrified seats” gimmick. I have two original release posters staring down at me from the walls of my apartment as I write this. And I know the score (and sound effects) so well I can hum them at key plot points. In short, I love THE TINGLER. I also acknowledge that, strictly speaking, it’s not a great film. 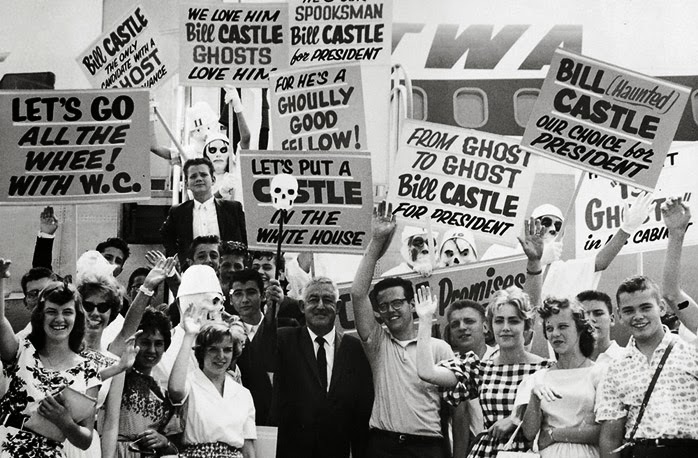 But the fact that it’s not great – and doesn’t try to be – is an integral part of why I love it, and why I love William Castle. Born William Schloss in New York City on April 24, 1914, Castle started his film career at Columbia Pictures at age 29, directing low budget programmers and B-pictures. His early assignments included four installments of The Whistler series and four Crime Doctor films, both based on popular radio shows, and both making copious use of shadow to mask threadbare budgets. Castle also helmed discount Biblical “epics” like SLAVES OF BABYLON (1953), sword and sandal potboilers such as SERPENT OF THE NILE (with Rhonda Fleming as Cleopatra), and Westerns like the 3-D Technicolor shoot-em-up FORT TI (1953). All are perfectly competent, but mostly forgettable. As a director, Castle was a serviceable journeyman. As a showman, he was a genius. And beginning with MACABRE (1958), based on the novel The Marble Forest, the grand master of movie gimmicks hit his stride. Castle and his partner, writer Robb White, self-financed the film for $90,000, sold it to Allied Artists for $125,000, and issued insurance policies from Lloyd’s of London to moviegoers “in the event of death by fright.” Costumed nurses were dispatched to theaters around the country to treat terrified patrons, and Castle, himself, appeared at a venue in Minnesota. In a coffin. Next came HOUSE ON HAUNTED HILL (1959), again written by White and again featuring a hook: life-size plastic skeletons rigged on wires, dancing above the delighted (and mostly pre-teen) audience. Castle called this gimmick EMERGO, and bragged on the posters “the thrills fly right into the audience.” (Your results may vary, depending upon your age and/or level of intoxication.) 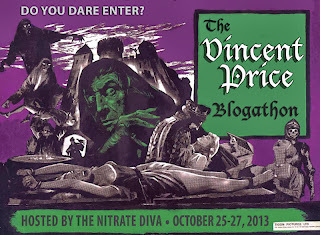 HAUNTED HILL also marked the director’s first teaming with Vincent Price, who had cut his genre teeth in Andre de Toth’s HOUSE OF WAX (1953) and John Brahm’s THE MAD MAGICIAN (1954), both in 3-D. Price would return for Castle’s next project, released five months later – with an even more creative promotion to get people into (and out of) their seats: the spine-tingling miracle called PERCEPTO! THE TINGLER begins, appropriately, with William Castle. Unlike in MACABRE, where an anonymous narrator handles the hyperbolic warning (“The management of this theater is deeply concerned for your welfare!”), here the director himself trundles out, stands in front of the “screen,” and addresses the audience directly. Kids made up a large portion of the audience at Castle’s films, and writer Robb White goes to great lengths to explain the pseudo-scientific plot of THE TINGLER throughout the first half of the film, over and over again. Honestly, it’s not really that complicated unless, perhaps, you’re 8-years-old and hopped up on Coca-Cola and Jujubes. Price plays Dr. Warren Chapin, a slightly lugubrious medical examiner in an unnamed city. By day, he joylessly performs autopsies on electrocuted murderers like the one we meet in the first moments of the film (he’s not named, so I’ll call him Crazy Eyes.) By night, Dr. Chapin conducts “experiments in fear” in his conveniently located home examining room (which looks more like a dentist’s office than a mad scientist laboratory). “Maybe it’s the force that makes your spine tingle when you’re scared,” Ollie offers. Warren offers to drive Ollie home because, even though he enjoys sitting in on autopsies, he seems like an otherwise decent chap. Back at Ollie’s place, Warren meets Mrs. Higgins “a deaf mute” with Obsessive Compulsive Disorder and a terrible case of split ends. Warren cuts his hand on a broken saucer, and Ollie’s wife swoons silently, then faints. By this point, if you’re older than 12, you’ve already figured out the plot for the rest of the movie. By the way, did I mention that Ollie and Mrs. Ollie operate a movie theater, which they live above? That narrative convenience will come in handy later. It’s also a silent movie theater, which is a pretty witty inside joke on Robb White’s part. Speaking of witty, Warren has a duplicitous wife (Patricia Cutts) who may, or may not, have killed her wealthy father in order to inherit his fortune. Isabel and Warren trade bourbon-soaked, barbed bon mots every night (when she’s not out alley catting). “There’s a word for you,” she says. “There are several for you,” her husband sneers. Warren’s handsome young assistant David (Darryl Hickman) is in love with Isabel’s sister Lucy (Pamela Lincoln, who married Hickman not long after the film wrapped). They head off on a hot date, Warren and Isabel bicker, and Dr. Chapin shoots his duplicitous wife. The gun is filled with blank cartridges, of course, but Isabel is out cold long enough for Warren to x-ray her spinal column (using what looks like a photo enlarger) and discover something very important, plot-wise. First, Warren tries to road test his theories on himself. Clean-cut David scores him some LSD, and Warren injects twice the suggested dose. He then narrates his totally ungroovy acid trip into a tape recorder until he collapses. Guess where Warren goes next? 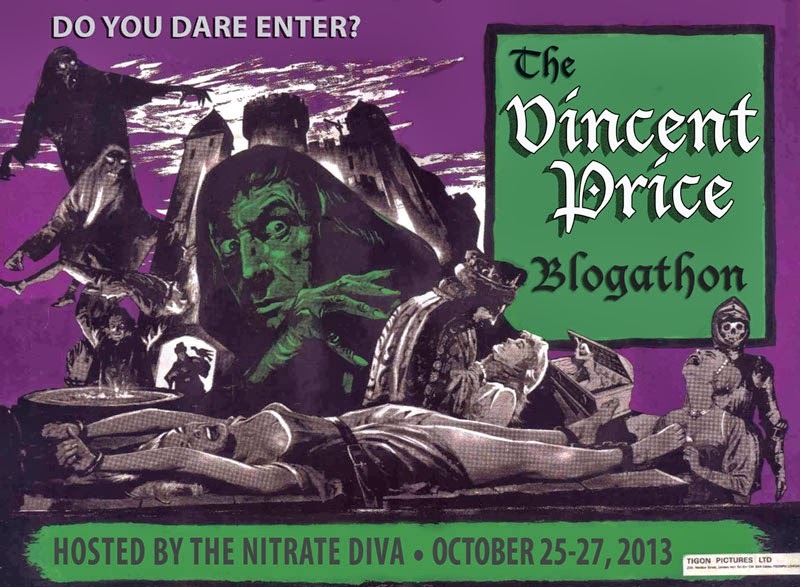 To visit Ollie and his mute wife, who ends up dying under mysterious circumstances (are there any other kind of circumstances in a William Castle film?) Ollie brings his dead Mrs. to Warren’s house/lab where the good doctor performs an autopsy – with Ollie, once again, gawking at the proceedings. As he predicted, Warren finds a “sinewy,” lobster-like creature wrapped around Mrs. Higgins’ spinal column. He removes the monster – stylishly shot in silhouette by cinematographer Wilfred M. Cline – and stores it in a Tingler-sized carrying case he just happens to have lying around. Then Ollie decides to take his wife’s dead, recently autopsied body home, wrapped in a sheet (because it’s “late” and he doesn’t want to further inconvenience anybody). Warren finally has the breakthrough he’s been searching for all his life (or, at least, for the first hour of the movie). But before he can debut his discovery to the scientific establishment, Isabel drugs her husband, retrieves the Box o’ Tingler from the lab, and dumps it on the carpet. With the help of a prop man and a very visible string, the monster attacks the scientist, wrapping its tentacles around Warren’s throat. Only a well-timed scream from Lucy saves his life. The next morning, Warren has had a change of heart: The Tingler must be destroyed. He tries to burn it with a blowtorch, to no avail. But The Tingler has other ideas. Warren brings it to Ollie’s house to restore it to its rightful place in his wife’s corpse, hoping it will wither and die. But the creature escapes from its case and crawls through a loose board in the floor. “What’s below this?” Warren asks. With this line, most live audiences squeal, laugh and applaud with glee. Because the moment we’ve all been waiting for has finally come. I won’t tell you what happens next, but it’s pretty much exactly what you expect, only worse (which actually makes it better, if you’re following my logic). It’s during the climatic scene in the on-screen theater that technicians in real-life movie houses in 1959 flipped the switch and “shocked” paying customers with vibrating motors attached to the underside of the seats. In addition, local employees engaged in a variety of supplemental shtick – screaming, carrying people out on stretchers, and generally creating a melee. In modern live performances I’ve attended, ushers run up and down the aisles aiming flashlights at screaming shills in the audience, who dramatically attack themselves with Tingler-esque props. All the while a loud buzzing effect is heard, meant to mimic the sound of an electric chair, or of your spine being “tingled.” Although the actual scene in the film lasts for just 30 seconds, some theaters at the time reportedly stopped the film and brought up the lights to attend to the “injured.” Those injured parties would be back for the next performance, to be “attacked” all over again. The live component made each “performance” unique, and the gag was a hit. After the film attracted sold out premiere crowds in Baltimore and Detroit, Castle ordered 100,000 additional motors to be deployed to larger theaters across the country. According to a 1959 Variety article, every tenth seat was fitted with a buzzer, and the rigging process took up to four hours, depending upon the size of the theater. This added an additional $250,000 to THE TINGLER’S production budget, but the film still made a healthy profit. Castle and Columbia would go on to release 13 GHOSTS in the Summer of 1960 (gimmick: an ILLUSION-O “Ghost Viewer” for every audience member), followed by HOMICIDAL in the summer of 1961 (gimmick: a Fright Break wherein scaredy-cats could elect to leave the theater, get a refund, and sit in the Coward’s Corner in the lobby), and MR. SARDONICUS in October of 1961 (gimmick: the Punishment Poll, wherein the protagonists’ fate is supposedly, but not really, determined by the audiences. Each of these films is entertaining, and I’ve seen them all at least once live, with the gimmick. I also have posters for all of them in my apartment, much to the chagrin of my girlfriend. (Sorry, honey!) But none of them compares to the perverse magic of THE TINGLER – a thriller that’s thrilling despite its complete lack of thrills. Or maybe because of its complete lack of thrills. Will McKinley is a New York City-based writer, producer and classic film obsessive. He’s been a guest on Turner Classic Movies, Sirius Satellite Radio and the TCM podcast. Will has written for PBS and his byline has appeared more than 100 times in the pages of NYC alt weeklies like The Villager. He watched his first episode of "Dark Shadows" on April 12, 1982 and hasn't been the same since. He writes about classic film at CINEMATICALLY INSANE. That was really great. Thanks!